This is my assignment with the Secret Recipe Club.The aim of the club is that you are allocated a blog from which you have to select a recipe and try it and blog about it. For the month of February my assigned blog was Mangia which means "Eat" in Italian. Mangia is written by Chelsey who comes from a large Italian family and lives in Texas. The main theme of the blog is healthy gluten free recipes. I really enjoyed reading the blog and discovering new healthy ingredients for cooking. I chose the Coconut Banana Bread bites for my challenge.We really enjoyed them. 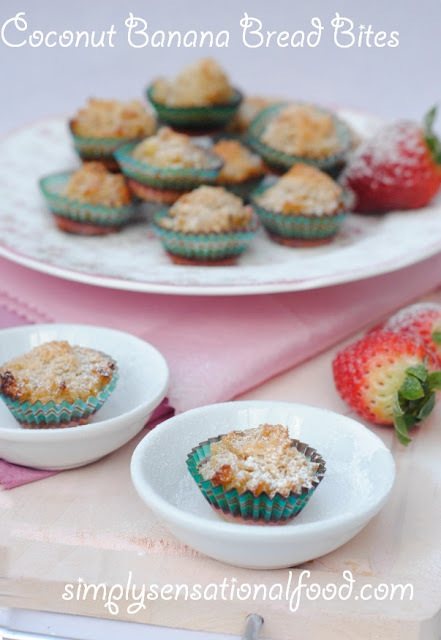 Healthy and delicious banana bites encased is sweet tendar coconut..
1.Preheat oven to 180 degrees C / 350 Ddegrees F.2.line a mini muffin tin with mini cake liners.3.In a large bowl add the bananas and mash them with a fork. Add the coconut flour, dessicated coconut, maple syrup,vanilla essence ,salt, almond butter, coconut oil, cinnamon and flax seed meal and mix together to form a dough. 4.Fill the mini cake liners with a teaspoon of mixture in each and bake in the preheated oven for 12- 15 minutes until golden brown. 5. Remove from oven and serve with a glass of cold milk. These look really good! I bet my kids would love them, plus their perfect sized for snacks! You were my assignment this month and made your oreo cheesecake. Everyone LOVED it!!! I am so glad you chose this recipe Nayna! They look delicious! Great job! I love baking with coconut flour, although it has it's challenges. These look like they came out perfectly, great job. 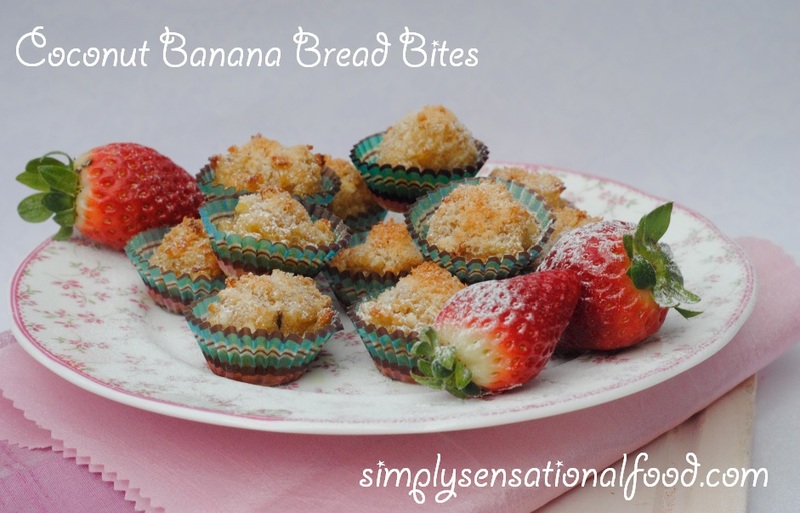 I'm a coconut and banana lover, thank you very much for sharing :) I can't wait to try these! Coconut goes with everything !!! Nice combo.. the biite sized ones look cuter..
Yum love coconut - these look delicious!